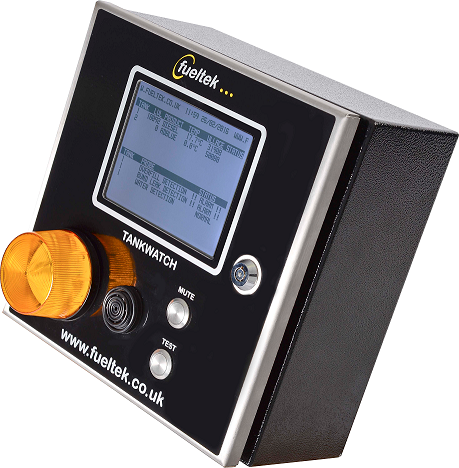 The TankWatch fuel tank monitoring system is the perfect complement to our FT4000 range, or as a stand-alone system for tank monitoring only. With the high cost of road fuel all transport operators are under great pressure to manage fuel resources more efficiently and be more environmentally friendly. Tank watch is a premium bulk fuel tank management software that helps managers by providing accurate information on current stock, available tank capacity (ullage), stock movements, deliveries and throughputs making it easy to assess any problem areas. The TankWatch fuel tank monitoring system allows for easy tracking of the fluid inside the bulk fuel tank using a series of probes. The probes are connected to a control panel which is mounted locally at the fuel tank. The control panel provides a local interface at the point of storage and assists fuel delivery drivers make safe and secure deliveries. 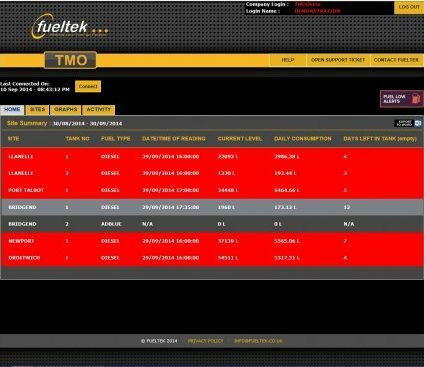 TANKWATCH interfaces with FUELTEK FMO to complement the FT4000 range and FUELTEK TMO tank management software if it stands alone, to provide comprehensive reports and alarms remotely at any internet enabled device. The TankWatch fuel tank monitoring system comes equipped with a state-of-the-art control panel that constantly displays stock level information including ullage, and also displays an alarm status. If an alarm is triggered, this is indicated audibly and visually at the fuel tank. 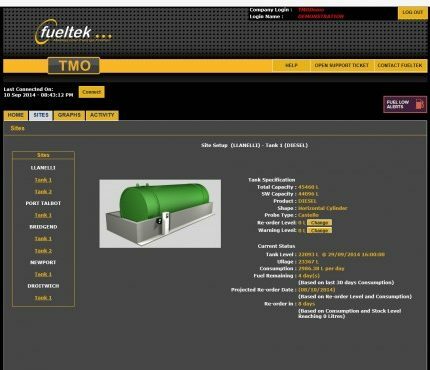 The bulk fuel tank management software system will even provide early warning of tank leakage if unaccountable reductions in tank contents are recorded. Alarms and alerts can be set for unusual stock movements, such as if the fuel level in the tank is reducing but the fuel pump connected to the tank is not running. TankWatch can isolate fuel pumps if low stock levels are detected. TankWatch will detect all deliveries into your bulk storage tank and provide you with visual alerts and information about the delivery. All alarms and alerts can be emailed or sent by text if preferred. 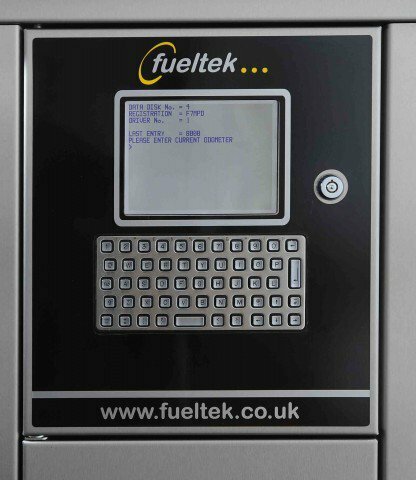 TankWatch can be used in its own right to manage bulk fuel tank stocks, or it can interface with other Fueltek fuel management systems which monitor pump throughput and stop unauthorised use of fuel, either way TankWatch provides a powerful reporting and management tool. 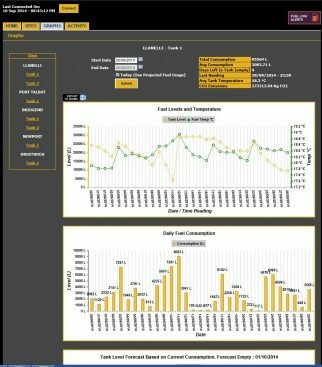 The unique tank management software used not only for managerial, but also reporting purposes, is web hosted, browser based, user friendly and can provide information at any location with internet access. Communication between the remote hardware and the reporting software is most commonly done using GPRS modems to allow internet connectivity at the FACT. GPRS (General Packet Radio Service) is a wireless data service and is a connectivity solution based on internet protocols. No call charges apply using GPRS as a small monthly rental fee covers an amount of data transferred. We can network Interface allowing the TankWatch to form part of a LAN / WAN. We can utilise Bluetooth, Wi-fi or even cable RS232 or RS485 to provide a route into your own Broadband connection if required. The reporting software uses administrator set account numbers, login and password, management information can potentially be made available on any PC anywhere in the world for a user with an authorised account number, login and password. TankWatch is built for use in harsh transport environments, as it has a heavy duty enclosure, and a bright display, that is easy to read in daylight. Bulk fuel tank measurement is by a high accuracy pressure sensor that is individually calibrated to take account of tank geometry. The TankWatch fuel tank monitoring system can be specified for new installations but is also easily retrospectively fitted to existing tanks. Provide audible and visual alarms at the tank location if an alarm is triggered. Provide warnings if deliveries or stock movements exceed or fall short of expected levels.